A nurse listens to a client’s chest at the Spanish Catholic Center agency of the Diocese of Washington Catholic Charities. With open enrollment for many medical plans in full swing, health care is top of mind for millions of Americans. 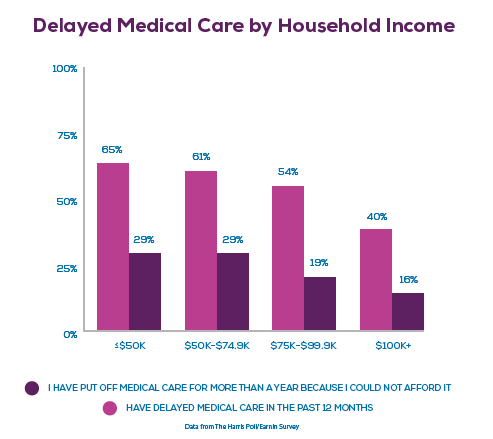 But health care is still too expensive for most: A majority of U.S. adults have to delay getting the care they need, or put it off completely, because they can’t afford it, data from financial website Earnin shows. According to the research, which combined Earnin-user data with data from a Harris Poll survey of more than 2,000 adults, 54 percent of Americans say they’ve delayed care for themselves in the past year because of cost, and another 23 percent delayed care for more than a year for the same reason. Meanwhile, 10 percent of Americans with children under the age of 18 have delayed care for a dependent or child because of financial issues. The three types of care that are delayed most: dental work, eye care and annual exams. Of those who have delayed care in the past 12 months, 55 percent put off dental and/or orthodontic work, 43 put off delayed eye care, and 30 percent put off annual exams. While, “if you’re healthy, delaying, or even skipping, your annual physical may not be a big deal,” says Earnin, “delaying dental care can be especially costly.” In 2017, according to the Agency for Healthcare Research and Quality, emergency room dental visits cost $1.9 billion. Less than 40 percent of Americans say they have enough money to cover a $1,000 emergency, and 34 percent of Americans had to cope with a significant, unexpected expense over the past year. “Student loan debt, credit card debt and personal loans continue to grow,” the report adds, while middle-class incomes have shrunk in all but two states. As a result of the fact that health care is so expensive in the U.S., many Americans defer treatments they need until they receive a tax refund, assuming they get one at all. A 2018 JPMorgan Chase & Co. study found a “dramatic link between health-care spending and tax refunds” citing that “consumers’ spending on health care was significantly affected by cash-flow dynamics” since they increased out-of-pocket spending by 60 percent in the week after getting a refund.